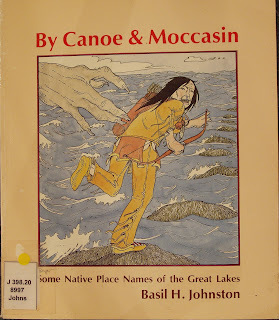 Basil H. Johnston is an Ojibway member of Cape Croker Indian Reserve in Ontario, Canada. I borrowed this 1986 book from my local library and I am surprised to find that it appears to be in pristine condition. It is such an interesting book. Through a number of stories about the Manitou Nanabush, we learn the history of many names for locations near the Great Lakes. If you are interested in purchasing one of Basil Johnston's book, visit the 'Whetung Ojibwa Crafts and Art Gallery'. After browsing Mr. Johnston's works, scroll to the bottom of the page to find the link to the main gallery page. Well worth browsing the other featured artists. I am currently reading 'Uncle Dave', which is a story of Basil's Uncle Dave who was born with Down's Syndrome. In this book he has compared the way his uncle was treated with how the white population treated the Indians. I have only read the first two chapters, though they have left me wanting to read more. I hope to have it finished by next Friday. I love to see what you're reading. I love this series of posts - so interesting and informative to learn about the ways of other people/cultures. Very interesting! I wish my local library had more than just fiction.